This winning entry for the first edition of the Salon Kitchen Challenge -- in which we asked bloggers to come up with an imaginative use for their Turkey Day leftovers -- comes to us courtesy of Juliet Waters. Check out this week's Challenge here. I'm Canadian so we had our Thanksgiving back in October. But Thursday morning my 9-year-old son let me know that he was decidedly meh about the tofurkey slices I'd tried to slip into his lunch that week. As I was staring at these thin, sad slices of faux meat, I started thinking about all my Open Salon friends and the fabulous turkey dinners they would be preparing and enjoying all day. Then I started feeling kind of lonely and really hungry. And that's when I got the idea to renounce my ridiculous vegan aspirations, and spend the day inventing a fabulous leftover recipe that would be waiting for them when they got back. This is really only half invention, since turkey mulligatawny soup is a leftover feast tradition in my family. But we usually have it the day after Christmas (or Boxing Day as we call it in the Commonwealth), and we tend to have it with our golden white yukon potatoes. I knew sweet potatoes would be fabulous in mulligatawny, but I did feel a responsibility to try it out first. Plus, I was hungry, and I was going to need pictures and an excuse to drink. Mulligatawny, if you've never heard of it, is your classic Anglo-Indian dish. At some point while the Brits were pillaging/colonizing India, someone got the idea to fuse the two cuisines and the results, when done right, can be awesome. (When not awesome, the Brits pretend they are anyway, or make some condescending remark about how real countries don't care about food.) There aren't that many things America lost out on when it decided to have its own country. But had you stayed, you might be able to put this can of Heinz Mulligatawny in your "trolley" for only 82p. It might seem a little against the grain to follow up American Thanksgiving with a shout-out to one of the few good things to come out of the British Empire. But now that you've successfully stolen Hugh Laurie and made him your own, I don't see why you can't do the same with this exceptional leftover feast soup. And, anyway, mulligatawny is more of a concept than an actual recipe, so you can fuse it into almost any national cuisine. I'm not big on recipes. If you want one I recommend this one from Epicurious as a good standard. Instead I'm just going to give you the essential rules to avoid disaster. 1. Color combination. The base of a great mulligatawny should be a golden yellow or orange purée. So the first stage should only involve ingredients that won't mess with that color scheme. (If you're ambitious you'll want to boil down that turkey carcass into stock. But if you put anything green in there, make sure you strain it out first.) In this stage you combine sautéed onions, garlic, red (not green or brown) lentils. If you have any leftover sweet potatoes, or potatoes of any kind, this is where you throw them in. (Or you can skip potatoes and serve it the traditional way, with rice.) Mess with this rule and you'll end up with something that might be tasty but will resemble a big bowl of bird poop. And nobody wants that. If you're throwing in cooked potatoes, or leaving out potatoes, mush stage is usually about 20 minutes. Closer to an hour with raw potatoes. Lemon or lime, added in at the end to make sure you get the right balance. 4. Last things last. Coconut milk, lemon or lime juice, and anything green (leftover string or wax beans if you must) go in at the last minute. There are all kinds of great garnishes you can throw on here too. Peanuts or almonds are good. Yogurt if you've gone a little overboard on the sweetness. Pour yourself a small bowl and experiment if you're not sure. Oh, yeah, and finally the turkey. Don't cook this at the mush stage. You want nice meaty chunks. Now, while I'm tempted to recommend champagne for the bonus points, the single best drink with any Anglo-Indian meal is beer. 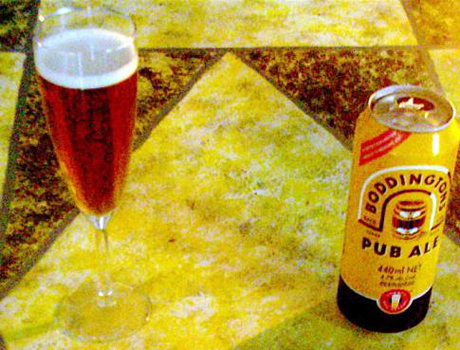 But if you're still feeling a little stuffed, or watching your weight, enjoy a nice imported British beer, without the extra calories, by pouring it into a champagne flute.